The H visas are highly coveted, and there are never enough to go around. The basic difference between these H Visas is that H-1 is for college-educated workers, H-2 is for both college-educated and non-college-educated workers, and the H-3 is for nobody (just kidding, although the H-3 standards are so high, it seems that way). H-3 Visas are for workers who have been invited to participate in a work training program in the U.S.
To recap: H-1 = college-educated worker; H-2 = non-college-educated worker; H-3 = work training program. So what makes the H Visas similar? They are all TEMPORARY, that is, they are all for temporary stays, and for the H-1 and H-2, they are all of VERY LIMITED NUMBER. How much time in the U.S. is allowed? For H-1 (college-educated), it’s maximum 6 years. For H-2 (non-college-educated), it’s an aggregate total of 3 years. For the H-3 (work training), it’s a maximum of 2 years. To recap: H-1 = 6 years; H-2 = 3 years; and H-3 = 2 years. How many H Visas are available? For H-2 (college-educated, 6 years), there are only 85,000 per year. For H-2 (non-college-educated, 3 years), there are only 66,000. For the H-3 (work training, 2 years), there are an unlimited amount, but it is very difficult to qualify for one. To recap: H-1 = 85,000; H-2 = 66,000; and H-3 = unlimited but difficult. That is a brief look at the H Visas. Please contact MIA if you have any further questions about whether you qualify for an H Visa, or whether there may be some other opportunity for you. MIA’s services can be found at http://www.miamivisahelp.com. Please feel free to send an email! I get tired of communicating with my uni’s staffs and their law and logics or it is better to say lack of logic. I really hate this envirnmoment and I wonder if I leave my education what would be the consiquences for me as F1 visa holder. What I can do to prevent immigration status or it is better to ask after leave my universuity how I can stay at US legally? what are my options? in future if I want to continue my education would this leaving affect any academic performances of mine? Answered less than a minute ago. Immigration Attorney in Miami, FL. Please note that to transfer schools as an F-1 Visa holder, it appears that you must be a full-time student at the time of your transfer request, otherwise you may have to request reinstatement to student status. So before you leave your education, be careful. You may wish to stay at your current school and decide/apply if and where you want to transfer, rather than leave first and then ask for a transfer. If you decide you want to leave, you should talk with your new desired school. You may wish to tour the school, ask other international students if they like it, and ensure that you can get in. Once you apply and confirm that the new school will take you, you should notify your current school of your intent to transfer. You current school should in turn will update your status in SEVIS as a transfer-out student (to be released at the end of the semester or session, or earlier if you request). It seems that you can cancel your transfer during this wait time, just in case you change your mind. After this transfer wait time, your new school should be granted access to your SEVIS to complete your transfer and issue the I-20 transfer form. There appears to be a deadline to contact the DSO at your new school (15 days before new school start date), so you should leave plenty of time to contact the new school’s DSO and to make sure that the new school’s DSO updates SEVIS that you have transferred and enrolled (you should get a copy of this form). Considering the risk of losing your F-1 status by just dropping out, you may want to weigh all your options an make sure that you want to leave or transfer. PUBLIC’S QUESTION: Study/ work part time Except my full time job on L1 Visa – Possible? Hi, Is this possible .. It appears that working for a different company may require applying for a different type of visa. A person with an L-1 Visa is limited to working for a qualifying member of the multinational group (the company, its affiliates, branches, subsidiaries, or parent) that sponsored him or her. If the L-1 Visa holder has a regular L-1, you may have to notify the USCIS of such a transfer, however a blanket L-1 holder may not need to notify the USCIS. You may, however, work part-time with your L-1 Visa at your sponsor company, or you may apply for a green card, or you may apply for some other visa. What is some information on how this is filed and some basic procedures on doing this? Can a detainee do this by himself? Traditionally, immigration habeas corpus were used to either challenge a removal order or to challenge a detention. Nowadays, it seems better suited to challenge conditions or duration of a detention. For example, if the ICE (Immigration and Customs Enforcement) detains a person for over 6 months without deportation, the ICE may have to release after a habeas corpus petition. The Court of Appeals now serves as the forum for most of those traditional habeas petition issues. However, if you still wish to file a habeas on length of detention issues (in order to be released from detention until you can be deported), a petition may be filed in district court for a small fee. A petitioner may wish to wait for the 6 months to go by, and you may wish to first request an ICE Headquarters review to “exhaust remedies”. The petitioner should allege the name of the person who has custody over him or her. For example, the petitioner may wish to describe the person with daily control over his or her custody or the person with authority to grant release from custody. The petitioner may also want to talk about why his or her removal is not reasonably foreseeable, and all details about your particular case with copies of documents that you received. Send the original to court (by mail to the clerk’s office of the US District Court) and a copy to the U.S. Attorney. Afterwards, the government should file a response to your petition or a motion to dismiss. If you disagree with what they say, you should file a response within 14 days. If it becomes too complicated, you should immediately talk to a lawyer. Otherwise, the judge should make a decision within several months. PUBLIC’S QUESTION: I am already at the stage of FINAL ORDER DEPORTATION I want to leave the country voluntarily for good how can I do it? I am already at the stage of FINAL ORDER DEPORTATION I want to leave the country voluntarily how can I do it? And Yes, I had already tried talking to immigration Services to see what I need to do but they say that I can’t leave. I have been ordered deported since of 1997 and have been on final order deportation long ago. I report to INS every month and since of 1999 and I am really tire of it now.. I have no rights, can’t travel, can’t do anything knowing that INS can still deport me back to Laos any day. Now I want to volunteer by leaving on my own accord. Can someone HELP me. I have consulted a several immigration lawyers already (7) It all lead me to they can’t help or don’t know what else to do. Answered 1 day ago. Immigration Attorney in Miami, FL. Your situation appears to be one of those unfortunately frusturating circumstances that may require a dedicated local immigration attorney. You may wish to contact the local pro bono attorney project to help connect you with free or low cost attorney services, if money is a prohibiting factor. If there is a law school near you, you may wish to contact the law school to determine if it has an immigration clinic that may wish to address your question.However, without being familiar with the exact details of your case and the series of events that led to your current situation, it would be quite difficult to provide a more helpful answer. PUBLIC’S QUESTION: Can My Employer file I-140 on my behalf while I have a pending asylum case? I would like to know if my asylum application would negatively affect my employment-based green card application if PERM is approved? I am in the EB category, by the way, if that matters. P.s. : employer followed strict government rules regarding the process. According to the USCIS regarding the I-140, you are NOT eligible to e-File this form if: 1) You are applying for a waiver of the filing fee; 2) You are requesting that your case be expedited (does not include filing for Premium Processing); 3) You are a Soviet scientist. You are eligible to e-File a Form I-140 if you are any other alien not listed above may be the beneficiary of an e-Filed I-140 petition. However, there are standards that must be met to file an I-140, specific documents that must be compiled, and a fee that must be paid. Considering that the USCIS also states that a decision should be made on an asylum application within 180 days after the date the application is filed, unless there are exceptional circumstances, you may wish to avoid the difficulty, cost, confusion, and uncertainty of simultaneous filing. Nonetheless, it appears possible to file a simultaneous I-140 and I-485 (adjustment of status) together. It also appears that the I-140 form itself does not expressly prohibit concurrent filing while an asylum status decision is pending. FInally, filing a concurrent application does not appear to be express grounds for denial of an asylum application. Thus, it seems that although there may not be an express limitation on concurrent filing of the I-140, you may still wish to have a local immigration attorney look over your case and the status of your asylum application to determine whether you and your employer should become invested in the I-140. For more answers to your questions, contact at abernhard@miamivisahelp.com or Miami International Attorneys at www.miamivisahelp.com. Come Study with the F/M Visas! The South Florida area is home to some 17 colleges and numerous language schools. The Miami area provides a diversity of educational opportunities for those seeking technical training, a bachelors, masters or doctorate degree, or who just want to polish their English (or Spanish!). 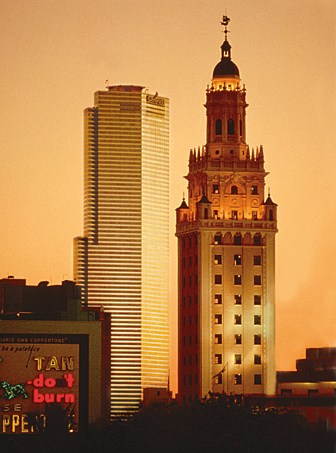 As a hub of international commerce and exchange, Miami is alive with international travelers, who arrive and depart every day from three massive sea ports (Miami, Fort Lauderdale, and Key West), two international airports, and a bustling highway, all looking to immerse themselves in the depth of educational options. The M-1 Visa is available to vocational students, while the F-1 Visa is available to academic students (including language schools). The First Step should be deciding what you want to study in the US, and what school or institution you would like to do it at. The Second Step should be ensuring that your choice school is SEVP certified (Student and Exchange Visitor Program). To check your SEVP you have to go to the SEVIS (Student and Exchange Visitor Information System) on the internet. Just ask the school to show proof of SEVP certification. In general, ineligible non-SEVP schools include: home school, pre-school and/or day care, public elementary or junior high school, online and distance education schools, adult education schools funded by the government, and FAA flight schools. So, if you’re actually taking the class in Miami, and are do not want to become a pilot or go to publicly funded school, you should be okay. If you are, you still might be okay, just maybe with a different visa. The Third Step, once you have picked a school, applied, and been accepted, should be deciding whether you need the M-1 or the F-1. You may want the F-1 if you are going to university, college, high school, private elementary school, seminary school, a conservatory, or other academic institution (including language training programs). You may want the M-1 if you are going to a vocational (for a skill or trade, like cooking or mechanics) or other recognized nonacademic institution. So remember, F-1 for SoBe Languages and the U, and M-1 for Le Cordon Bleu. The Fourth Step should be making sure that you apply at the golden moment: between 120 days and 30 days. Keep in mind that the Department of Homeland Security requires that all beginning students can only enter the US 30 days or less before the study start date (or get another visitor visa to come earlier!). Please also remember that if you apply for an F/M Visa more than 120 days out, the Embassy or Consulate will just hold on to your application until it’s withing 120 days of your study start date. You have heard the turn of phrase “business or pleasure?”, and with the B visas, you get both. The U.S. Government Department of State describes the B-1 as the Business Visitor Visa, and the B-2 as the Visitor Visa for Pleasure, Tourism, and Medical Treatment (although nobody can imagine why pleasure, tourism, and medical treatment fall under the same category). So, if you are coming for sightseeing, holidays or vacation on the beach, amusement, to see friends or relatives, party in South Beach, to see LeBron and Dwayne Wade on their home court, or even, yes, for a stay at Jackson Memorial (rest and medical treatment), then the B-2 is for you. If you want to skip all of that stuff and get down to business, consult and conference with associates face-to-face, attend a convention at the Miami Beach Convention Center for international yachting or marine biology, settle estate issues from a deceased relative, or negotiate contracts in person, then a B-1 is for you. Luckily, you do not have to choose. The B-1 and B-2 are frequently issued together as the B-1/B-2, hence we can just call them the B visas, so that you can have the best of both worlds. So long as you show both the U.S. consulate at application and the U.S. Customs officer at arrival in the airport. Moreover, the B Visas application is relatively quick and straightforward, you can use them for repeat trips to the US, B Visas can last between 30 days to 6 months and are thus flexible, there may not be any extended period of time before reapplication, and B Visas can be transformed into other visas. Keep in mind that you cannot work or run a business in the US with only a B Visa. Welcome to MiamiVisaHelp.com’s law blog … discussing everything visa from the perspective of those that have a need, desire, or tendency to move from country to country for the purpose of work, survival, education, living, play, and everything in between. Please feel free to send Andrew John Bernhard, Esq. a message! We are always trying to enhance your experience, and help all of us movers, migrators, immigrants, ex-pats and travelers have an easier, happier, and more satisfying experience in the often confusing world of U.S. Immigration. Please feel free to visit our friends at USImmigrationMiami.wordpress.com and TheMitochondrialMigrator.wordpress.com to see more from similar minded people like yourself!